Hi there and thanks for stopping by the blog today and Yay for Friday Eve! This past weekend I spend a few hours running errands, which led to me hauling several grocery bags up to our townhouse, hello extra cardio. But it means I now have a fully stocked pantry. 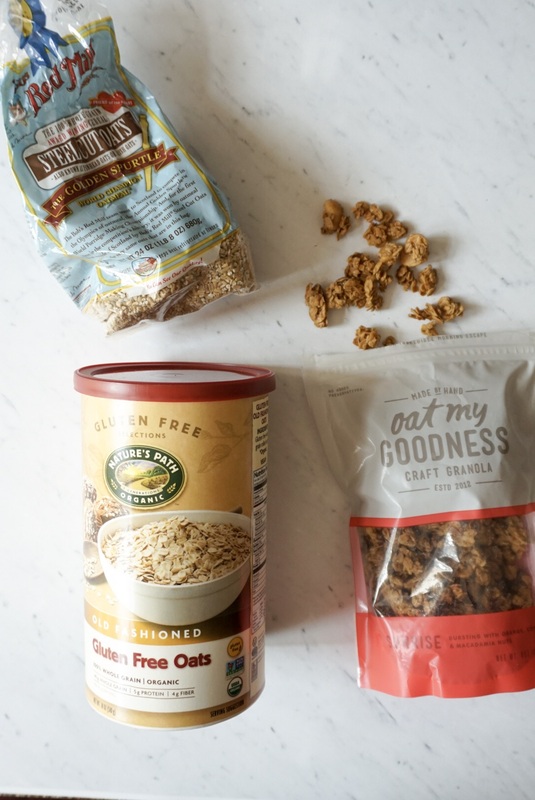 I thought it would be fun to take you through some of my must have healthy pantry staples. While I feel I have a stocked pantry, I’m still missing a few of the staples on the list. My pantry is the size of a broom closet, lol. I am always working on the organization, my pantry is far from anything Pinterest worthy. But here are a few of the items I can’t live without. Lately we’ve been loving jasmine or brown basmati rice, try either paired with my Jamaican Jerk Chicken or Italian Chicken Kabobs. I also always have quinoa and my favorite Banza pasta. Pasta can easily be combined with your favorite marinara, a lean protein, and some roasted veggies for a quick balanced meal. And I always have rolled and steel cut oats as they’re my favorite breakfast, which you well know from my What I Ate Wednesday posts. I probably have a whole shelf that stays stocked with nut butters. 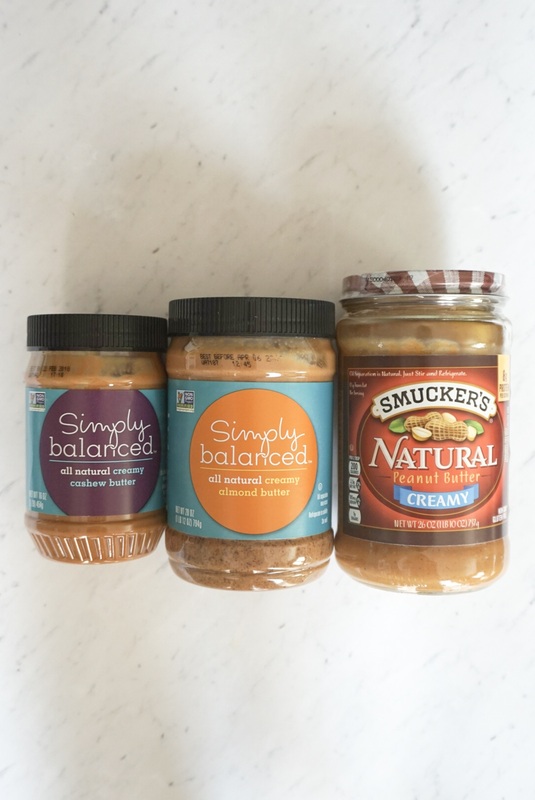 Smuckers Peanut Butter and Target Creamy Almond Butter are our favorites. Nut butters are great on toast, in oatmeal or try making my Oatmeal Raisin Energy Bites with your favorite nut butter as a healthy snack. I also like Cashew Butter as a healthy baking alternative. 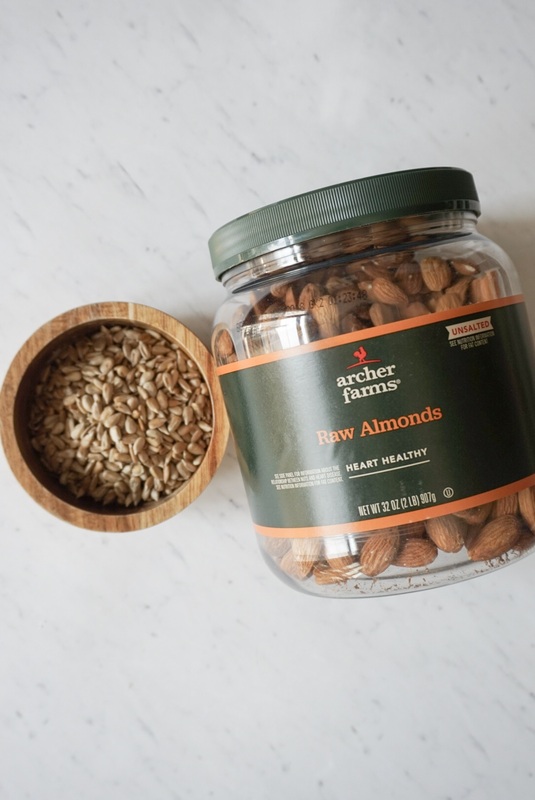 If I’m not snacking on something made with nut butter then I always have raw nuts readily available as well. Almonds, Cashews, Walnuts, etc. Try to purchase the unsalted or lightly salted varieties. Seeds such as sunflower or pepita (pumpkin) are my favorite way to add some crunch to a salad. Chia seeds are the perfect addition to overnight oats. And if you have a nut allergy sunflower butter can replace nut butter in just about any recipe. 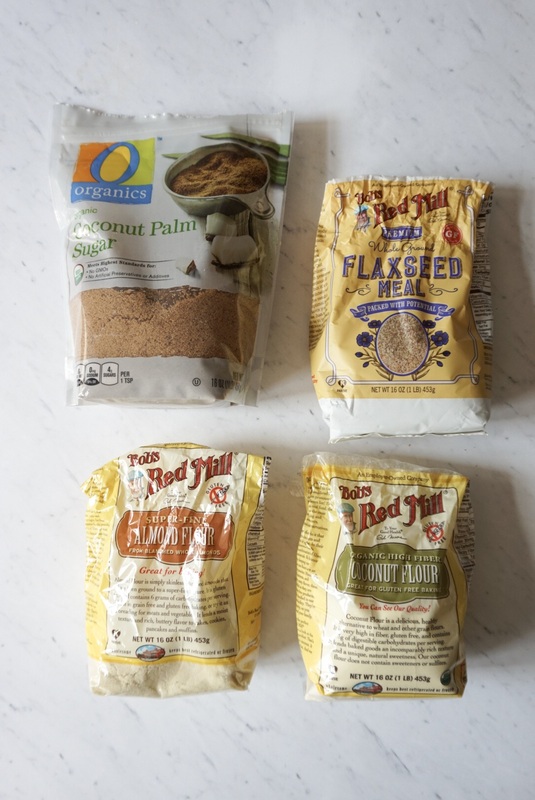 When baking indulgent desserts I use white flour, but for healthy cooking and baking I keep coconut flour, almond flour, flaxseed meal, and whole wheat flour. Bob’s Red Mill is obviously a favorite brand. And can pretty much be found at any food store, I find it cheapest at Target. We all know I have a sweet tooth. To make healthy desserts I use honey, maple syrup, or coconut sugar as sweeteners. I also think cinnamon and vanilla extract give a dish a little sweet flavor. I combine many of these in my Blueberry Lemon Baked Oatmeal. And how could we forget the chocolate, dark chocolate of course. I try to buy bars with about 70% cocoa or higher but this can sometimes be hard to find. Below is what my pantry is currently stocked with. And I love cocoa powder in smoothies or my Chocolate Caramel Protein Fudge. Cocoa powder has no sugar and 2 grams of fiber per serving! Dried fruits also help add a sweet flavor to any dish. My favorites are dates and raisins. I recently picked up this package of blueberries too. I look for dried fruits with no added sugars. There are several different pre/post workout supplements you can take. 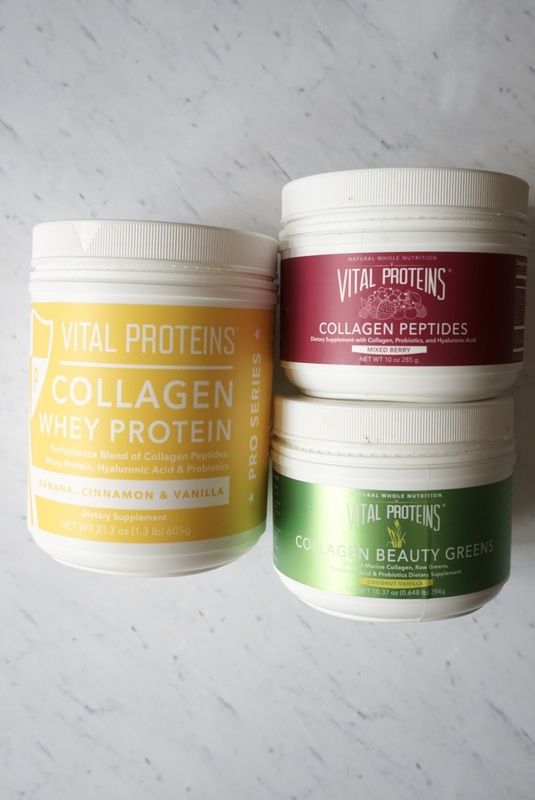 Personally I keep is pretty simple with vegan or whey protein and collagen. I have two cabinets full of spices, oils, and vinegars. I am always stocked with extra virgin olive oil, cooking spray, coconut oil, and wine vinegars just to name a few. And as for spices, in case you haven’t noticed from Instagram crushed red pepper is a favorite. I also use a lot of chili powder, cumin, and oregano. You’ll have to subscribe to my emails to get the full list. But I love adding diced tomatoes to flavor a dish or beans for plant based protein. Linking up with Amanda for Thinking Out Loud and Heather for Friday Favorites and Running on Happy & Fairytales and Fitness for the Friday Five. Enjoy your weekend and be sure to read previous Friday Favorites posts here. What are some of your healthy pantry staples? Name a pantry item you can’t live without. 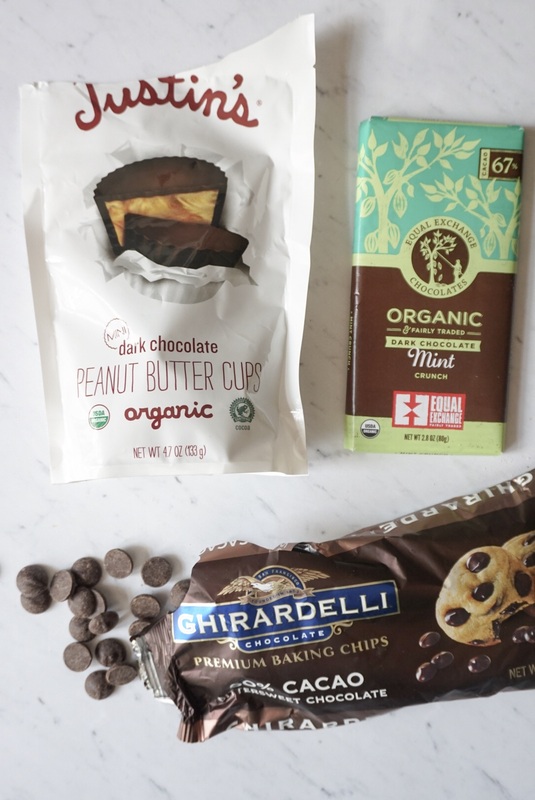 I love those dark chocolate peanut butter cups! We pretty much always have nut butters, canned beans and some sort of snack stuff for the babies on hand. I really need to organize our pantry, your post has inspired me. The Justin’s PB Cups are SO good right! And I really wish my pantry was bigger, I’ve tried re organizing several times and everything just doesn’t fit nicely. A large pantry is definitely on my must have list in our next house. The dark chocolate peanut butter cups look so good! I think they might happen to jump in my cart next time I’m grocery shopping 😉 I always have extra virgin olive oil, black beans, a ton a spices, and chia seeds on hand. Those are great staples Maureen! I have SO many spices, how do you organize yours? And definitely splurge on the PB cups, they’re delicious! We have a lot of similar staples! Nut butter is ALWAYS in my pantry as well as different oils. I’ve never tried almond flour, but definitely want to make protein pancakes with it! Yes I love replacing regular flour for almond in baked goods. And I use it in meatballs instead of panko or breadcrumbs to help keep them together. Yes to all these! I’d also add pre-made healthy sauces that make cooking easy! Sauces, marinades etc. As much as I like to make mine from scratch sometimes that’s just too much work! I totally agree Kelli. I like to think I want to make every sauce from scratch, but i know that’s not reality. Great idea to make some ahead of time though! 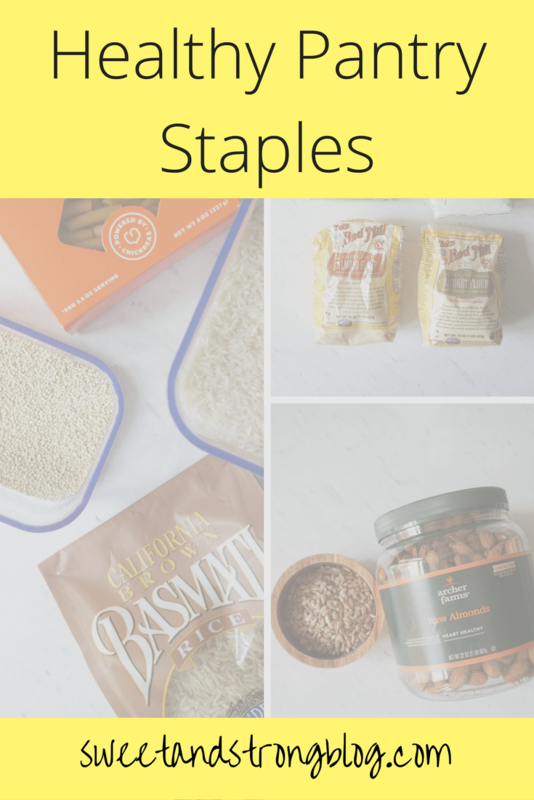 These are all fantastic staples! Have a great rest of your week Marina! 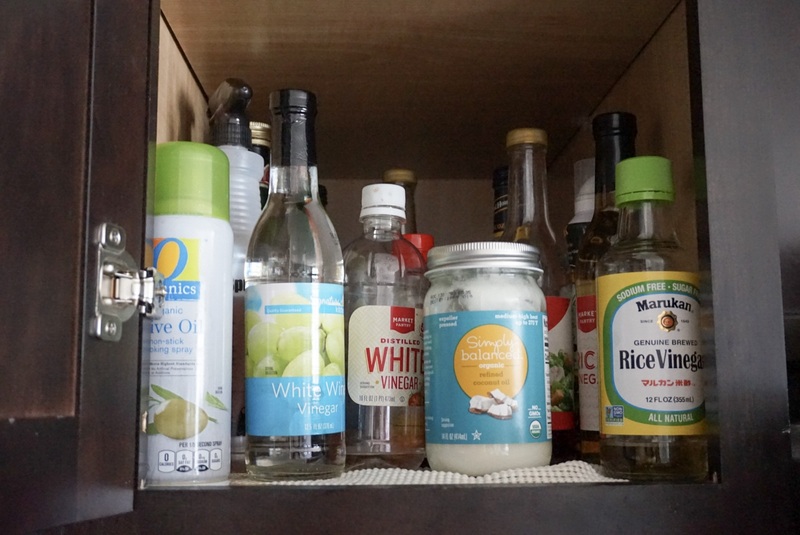 We have very similar pantry staples!! I always have one salty/crunchy snack. Usually pretzels. Probably shouldn’t be considered a staple but I always have to have it! Also usually some beans/legumes! We are huge fans of tortilla chips, especially because of my love for Mexican food. But I could eat a whole bag in one sitting, hehe And I lived off pretzels and PB in college. lol. I agree! I love seeing other peoples essentials and also seeing how they meal prep to always get ideas. And have a great weekend, always fun catching up with an old friend. We have a lot of the same favorites. I love snack bars a bit too much and like to keep some RX or Quest bars handy as well. 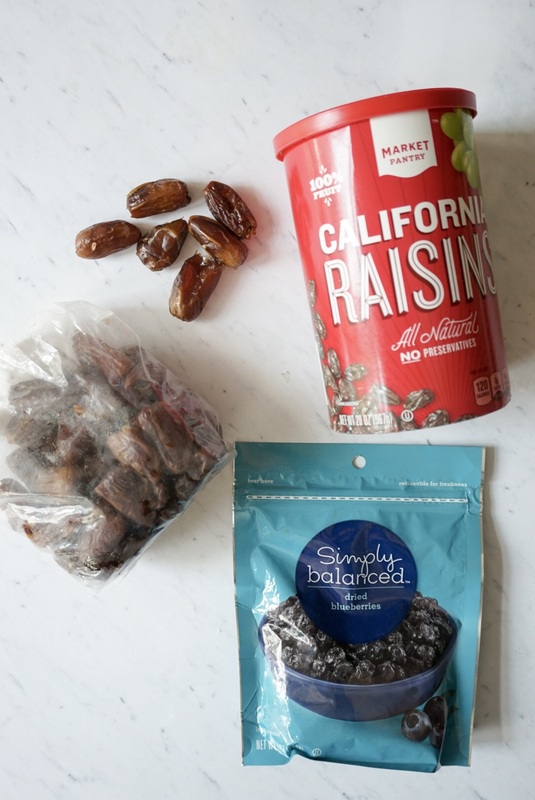 Yes, snack bars are a life saver during the busy work week. I find myself needing them when running errands on the weekends too. What are your favorite flavors? It makes things a lot easier when your pantry is always well stocked! SO RIGHT! I can easily whip up a non planned dinner when I have all these plus some veggies. I also keep mixed nuts in my cupboard too. But I have to put them on the back shelf because every time when I open it up I want to grab a handful. Same Lacey! I keep a 1/4 cup inside my nut jar so I force myself to measure it. Or I would eat the whole thing, lol. Yes canned beans are great for those lazy dinner nights. I love having frozen cauliflower rice. I could never imagine life without peanut butter! Have a great weekend. Def check out Banza Pasta and Vital Proteins. They’re two of my fav brands! Ditto to all of this lady! I always have Lundberg brown rice in my pantry, along with a few boxes of pasta. There are half a dozen nut butter jars in my kitchen at any given time as well. Another thing I always have in my pantry is a few kinds of beans, and I can’t live without cinnamon! Yes same with cinnamon, I have a huge tub of it my mom gets me from Amish country. Love it! Do I have to pick just one?! Or can my one be your whole list? I mean, that’s ONE list, right? 🙂 lol But yeah, I’m with you on the nut butters, oats, and the chocolate!